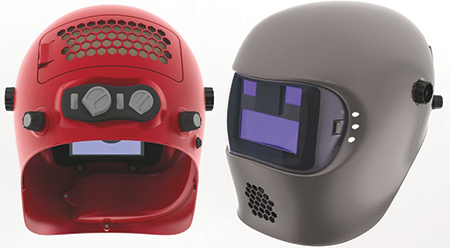 The Windmaker welding helmet, developed by metalworker Michael Buckman and recognized as a 2013 Invention Award winner by Popular Science magazine, draws in air through the back and pushes it through a HEPA-rated filter for the wearer to breathe. Because the air is being circulated into the mask by a fan, the helmet’s design cools the skin and prevents the faceplate from fogging. The Windmaker also expels air, pushing fumes a, and has LED lights along its faceplate that illuminate the work area. The helmet, which has yet to be tested by the National Institute of Occupational Safety and Health, is designed to create a filtered clean-air space inside, while keeping the user’s view illuminated and clear of obstruction. Photovoltaic cells recharge the helmet’s batteries from the light emitted by welding flash, to increase battery life. Product-development firm Salient Technologies, Inc. (STI), Bozeman, MT, developed a proof-of-concept prototype—fully functional and including an auto-dimming screen, LED illumination, filtered air intakes and exhaust system. Using rapid prototyping and RTV molding processes, STI combined off-the-shelf components and rapid-molded proprietary components into a functional and aesthetic prototype. Learn more and view a demonstration video at www.salient-tech.com/helmet. See also: Salient Technologies, Inc.